Much of the discussion around North Korea has focused on a nuclear or conventional war between Pyongyang and Washington, but little has been mentioned about one crucial topic: if the Kim regime fails and the country collapses, it will result in an unprecedented refugee crisis. For all of the tough talk by the U.S. as of late, the reality is that South Korea and China—not America—will be left to deal with the human toll of an armed conflict. On Tuesday, my colleague Gary Wetzel wrote that some 80,000 South Koreans in Seoul could perish after a week of conventional fighting alone due to North Korea’s artillery capabilities. Last year, the commander of U.S. forces in South Korea warned a conflict with North Korea could mirror World War II. Additionally, if Pyongyang collapses as a result, it could lead to hundreds of thousands—if not millions—of people searching for food and shelter and refugees fleeing for China and, depending on the circumstances, South Korea. Various powers have fought for control over the Korean peninsula for centuries, but it is what has taken place over the past 120 years that has most shaped the present reality. Imperial Japan made Korea its protectorate in 1905 after defeating the Russian Empire during its one-year Russo-Japanese War. Korea was ruled by the Japanese up until the end of World War II. Japan’s rule was so repressive that Koreans were conscripted into labor and even pressured to change their names to Japanese names. After Japan surrendered to the U.S. in 1945, the former Soviet Union and Washington split Korea along the 38th parallel, which is now known as the Korean Demilitarized Zone (DMZ). In the North, the Soviets installed Kim Il-sung; in the south, the U.S. picked Syngman Rhee, a staunch anti-communist strongman. The goal was to keep Korea under a “trusteeship” for five years, but Koreans tired of foreign rule and resisted the idea from the start. As Koreans fought to regain control of their country, the USSR and the U.S. were in an early Cold War power struggle over who would decide its fate as well. Meanwhile, from around 1948 to 1950, North and South Korean forces engaged in military battles along the DMZ until the North invaded the South in June 1950. The North took control of much of the South, until the U.S. pushed them back past the border. The United Nations controlled the North until China stepped in and restored communist rule. Since then, China has been Pyongyang’s biggest political ally and economic backer. In fact, China accounts for more than 70 percent of North Korea’s trade volume. Relations between Pyongyang and Beijing began to sour in 2006 when the North conducted its first nuclear test. In 2013, China endorsed UN sanctions against North Korea, but has still continued to support Pyongyang. Its reasons for doing so are complex. China wants as stable a North Korea as possible on its border. A collapse of its government could create a humanitarian disaster for China, and moreover, North Korea provides a buffer zone between China and South Korea. A fall of the North could potentially bring U.S. troops closer to China’s border and Beijing certainly doesn’t want that. It already protests the recently deployed Terminal High-Altitude Area Defense (THAAD) missile defense system. That is why China has been treating the North Korean nuclear situation so delicately. U.S. President Donald Trump has, until very recently, accused Beijing of not taking the threat of a Pyongyang nuclear attack seriously; until he changed his tune, that simply was not true. China has much more to lose than the United States in the long run. As it stands, China still supports North Korea, but does so begrudgingly. The same power Beijing had over Pyongyang in 1953 does not exist in 2017. Sure, it has official diplomatic ties with the North’s leadership, but the issue of nuclear weapons and the geopolitical dilemma they would cause complicates matters. North Korea is a powder keg of geopolitical problems and China can be directly impacted by all of them—and in the most severe manner. For now, the humanitarian crisis is one that really scares Beijing. A mass migration of refugees trying to enter China through its northern Liaoning and Jilin provinces would present complex economic, infrastructure, and cultural and political challenges. Jim Walsh, a senior research associate at MIT’s Security Studies program and one of the few Americans to travel to North Korea to speak with officials about nuclear issues, told me a North Korean government collapse could potentially threaten China’s political stability. “If your number one national interest is social stability, economic growth in order to hold on to social stability, having six million foreigners into provinces that have already had economic hardships before (won’t help),” said Walsh, who is also a board member at The Center for Arms Control and Non-Proliferation. Foxtrot Alpha spoke with experts who have been researching what could happen if an armed conflict broke out between the U.S. and North Korea and we broke down the scenarios below. Keep in mind that most of this is hypothetical, but now is as good a time as ever to think through the humanitarian lens what a war between the U.S. and North Korea could mean for China and South Korea. Is China Even Set Up To Absorb Millions Of Refugees? Generally, no. It also depends if millions of people will flood China at all. Most of the experts I spoke to say the Chinese have long feared such a scenario and would proactively reinforce the border with troops to minimize massive population flows. Andrew Scobell, a senior political scientist at the Rand Corporation, said we have to keep in mind the issue of internally displaced persons (IDPs), too. Not everyone in North Korea will flee to China. Some may travel from one city to avoid conflict or search for food and shelter. It would be nearly impossible to cross into South Korea through the DMZ because intense fighting would likely be happening there. For those North Korean refugees who live near the Chinese border and attempt to cross over, Scobell says they will likely be stopped by the military. Let’s start off with the fact that the term “refugee” is a blurry term in China to begin with. Yun Sun, a senior associate at The Stimson Center, a nonprofit global security think-tank, told me China, for example, doesn’t work with the United Nations High Commission for Refugees (UNHCR) on refugees in China. Beijing’s relationship with UNHCR is complicated, Yun says, because it sees the body as having played supportive role to Uyghurs—a Muslim ethnic group who suffered under Chinese rule—who fled that country for other parts of Southeast Asia. Part of the issue, as Foreign Policy wrote last year, is that China lacks the infrastructure to even handle mass immigration—the Chinese government doesn’t even offer assistance to refugees. It seems most logical to outside observers that North Korean refugees would head to South Korea; the two were once the same country and they share an ancestry and language. That all makes sense on paper. But it too would be burdened with a bevy of cultural and political challenges massive numbers of North Korean refugees would pose. Let’s say China ends up taking in the vast majority of North Koreans, as most experts I spoke with believe. It is very likely that Beijing would ask the United States and South Korea to share the economic burden of caring for them. Go Myong-Hyun, a research fellow at the Asan Institute for Policy Studies in Seoul who has researched North Korean refugees in South Korea, told me it is likely that China would persuade South Korea, the U.S., and the international community to share the economic burden of supporting them. From Go’s standpoint, Seoul would struggle to deal with a high number of refugees. Go conducted a study of North Korean refugees in South Korea and found that many of them bring issues of PTSD, a lack of adequate education and poor health. For example, North Korean middle and high school kids dropped out at a range between 4.2 and 7.5 percent between 2010 and 2013 compared to 1.2-1.3 percent among South Korean students during the same time frame. A survey by the Korean Educational Development Institute (KEDI) (2013) showed that out of 429 elementary and middle school North Korean refugee students, 10.7 percent of them reported being discriminated against or socially ostracized due to the fact that they were from North Korea. Fifty-four of them also reported that they would not let their South Korean peers know they came from North Korea if they were given the chance to transfer to a different school. Experts also point out that teachers who most interact with North Korean refugee students most are more often than not inadequately trained to handle their needs, and as the result they tend to cause more harm than good. Similarly, North Korean refugees in the workplace report having similar experience of social discrimination by their co-workers and superiors. For example, one employer whose employee is from North Korea expressed fear that his employee might kill others if provoked emotionally (Choi and Park, 2011). This prejudice stems from hearing or watching news that in North Korea, public executions are common. Even after taking into account the inevitable cultural misunderstandings in when dealing with recently arrived North Korean refugees, South Koreans’ strong prejudice and stereotyping of North Korea and its people are widespread and well entrenched. Yun said a lot of South Koreans suspect North Koreans of being spies. This is a very real fear, as North Korea does send spies to the south to gather intelligence. That’s why South Korea’s National Intelligence Service holds North Korean defectors for up to six months to determine if they are spies or not. They are then placed in a re-education facility for three months to learn how to adjust to South Korean life. 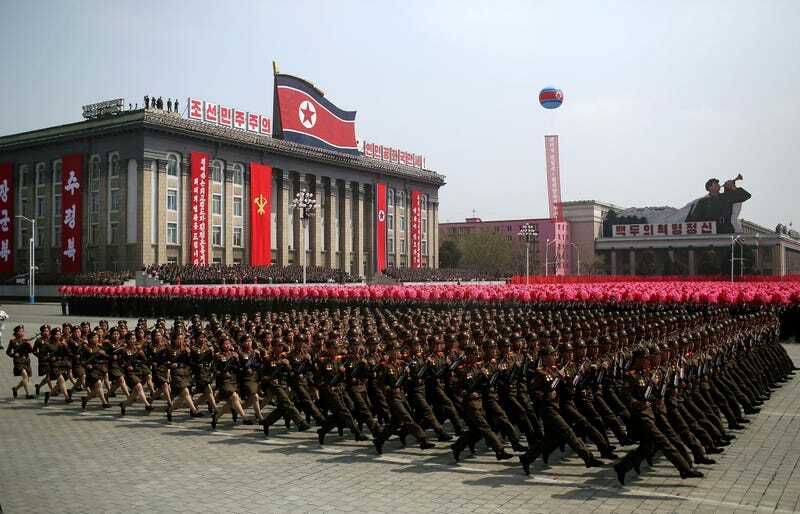 So far, 30,000 people have defected from North Korea. Imagine the cultural and infrastructure challenges that even double that number of refugees can pose. Or, say, hundreds of thousands, in the event of an armed conflict that forces Pyongyang to fall. That would be a lot of people for the South’s intelligence agencies to assess and its social services to integrate into South Korean society. And, given the current Trump administration’s anti-immigration stance, it is likely America would not be enthusiastic about taking many North Korean refugees either. What is important to consider in all of this is that nothing good will come of a pre-emptive strike against North Korea. If the U.S. attacks first, that will likely trigger a military offensive against South Korea and a full-scale war will follow. ay Pyongyang falls during such a war. That would leave China, the U.S. Japan and Russia (which, you’ll recall, installed its communist leadership after World War II in the first place) in charge of rebuilding it—pretty much the same players who had a role in the future of the Korean peninsula in 1945. Well, as you can see, that didn’t work out too well. And, if you’ve been paying attention to America’s handiwork in Iraq and Afghanistan, you’ll note the U.S. is pretty bad at nation building as of late. In the end, we have world powers deciding the fate of Korea—again. And a military approach is the primary solution the current White House administration has to deal with North Korea. Wars over the Korean peninsula have not historically produced peace and stability, so it is unlikely that one lead by Trump will convince Kim Jung-un to change his behavior either. What is likely to follow a war against North Korea is millions of people who have to be managed, many of whom would likely not want to be told what to do by outsiders—even if they do in fact despise the Kim family. Something tells me China does not want to even think about that problem. And neither does South Korea, which, by the way, doesn’t even have a president at the moment.